Welding is an absolutely great career and there are lots of reasons to become a welder. Becoming a welder, you’ll be able to perform a rewarding job with good payment. Also, there is an amazing outlook for welders and it continues growing. If you want to become a welder in North Carolina, you should know that there are 24 welding certification schools in the state. 4.1 Welding: What Is It? 4.4 Where Can Certified Welders Work in North Carolina? In case you decided to become a welder in North Carolina, you need to choose a school to start your training. As it was mentioned already, there are 24 welding schools in the state. Each school provides a bunch of important classes including such disciplines as Gas Tungsten Arc Welding (TIG), Shielded Metal Arc Welding (stick), or Gas Metal Arc Welding (MIG). If you want to become a welder, you need to have your high-school diploma or GED. Nevertheless, there are 4 high schools in the state that have welding training programs. It means that you can enter a school and start your training as a welder simultaneously. It gives you an opportunity to start your career right after graduation. 16 schools from the list above are community colleges. All the other options are tech schools or Job Corps facilities. Despite your choice, you should know that all schools from the list are approved by the American Welding Society’s SENSE Accreditation Program. Of course, choosing a future career, it’s important to know what salary you can earn. We’ve prepared for you some statistic so you can learn about welder’s salary in North Carolina. Speaking of a median salary throughout the country, it’s about $39 390 per year or $18.94 per hour. At the same time, welders in North Carolina have a median salary of $40 160annually or $19.31 per hour. The top 10% of welders throughout the country earn about $62 100 per year while the top 10% of welders in North Carolina earn about $56 470 per year. Before making the final decision, you need to learn some important info about welding. In fact, welding is a quite complicated career which requires excellent knowledge and a bunch of various skills. Of course, you’ll gain all of it during your training but still, we offer you to learn some facts to understand this profession better. In simple words, welding – it’s a process of joining metal pieces. To make it, you should use numerous tools to heat and melt metal. There are lots of responsibilities should perform. To become a welder, it’s not enough to get your certification. There some personal characteristics that are absolutely important. Where Can Certified Welders Work in North Carolina? There is the whole bunch of industries where certified welder can work in North Carolina. If you don’t feel like becoming a welder bust still, want to work with your own hands, there some similar career options. You just need to look for alternative careers in North Carolina. 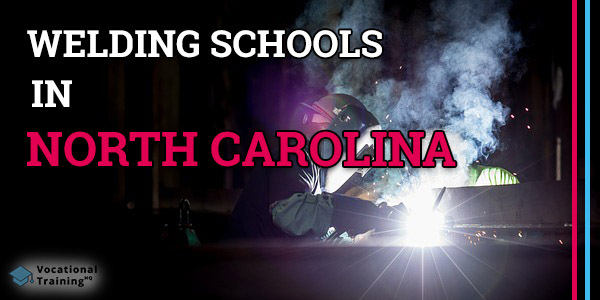 As you can see, there is plenty of schools that offer welding training programs in North Carolina. Also, as you’ve learned some facts about welding, you are ready to make your decision. Just choose the most suitable program and start your successful career as a welder.